When the owners of Clay Rat Studio, Eric and Elizabeth Boynton, decided to step back from the retail business, they reached out to their contributing artists to find out if someone would keep their special corner of Souderton’s art scene alive and well. Joanne Fabian decided it was the right time for her to take the reigns, and in February 2017, she did just that. Joanne renamed the business Art On The Hill, but kept many of the contributing artists, including the Boyntons. She knew the business, knew the clients, knew the talented artists, and felt that it would be a seamless transition for the gallery’s loyal following. Joanne describes Art On The Hill as a “small but mighty gallery with a boutique gift shop feel for every budget.” Everything in the gallery is one of a kind, with the work of 27 artists currently on display. A portrait photographer by trade, Joanne’s nature photography can be found throughout the space. Regularly contributing artists are from the region. As Joanne notes, “they come from anywhere from Manyaunk to New Hope to Pottstown to Easton, and everything in between. 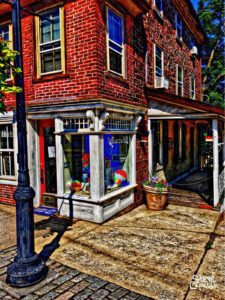 At least half of the artists are in Souderton or a bordering town.” Between 1 and 4 guest artists are highlighted each month. This may allow an emerging artist to be seen, or simply add a nice variety in the gallery. In house artists have the option to work gallery hours so they can meet customers and talk about their work. 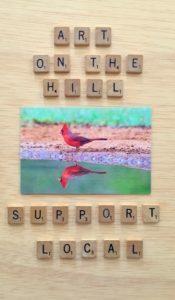 Art On The Hill strives to immerse art into the local communities and the local communities into art. To this end, Joanne believes in coordinating with all the art venues in Souderton, including Exhibit B Gallery, Montgomery Theater, and Consign For Design, to bring people to town and keep them here. Everyone offers something different, and it is all worth seeing. When all the business owners downtown act as tour guides to send people across the street, or around the corner to the ice cream shop, the popular coffee shop or the escape room, visitors and residents alike will discover the rich culture that Souderton has to offer. Joanne’s plans for the future include remodeling the gallery’s outdoor porch to make it into an additional show space, partnering with local businesses to facilitate larger shows for her artists, and working with local art students to feature their work in a professional venue. Speaking of students, Art On The Hill has just kicked off its 2nd Annual Christmas in July ornament contest. The contest is designed to introduce art to all different people, as well as to encourage families to work on an art project together. The contest is for ages from kids in Kindergarten to adults, and there are 4 age-based categories. All of the kid categories will award cash prizes to the winners, and the adult winner will receive a $50 gift certificate to the gallery. 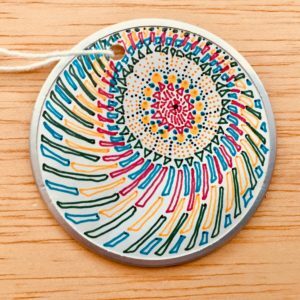 There are 80 blank ornaments available, so stop by the gallery to pick up yours for $1 each. Voting will take place all through July until 3rd Friday, when the winners will be announced! Votes are $1 each, which combined with the ornament cost, provides the cash prizes. Stop by Art On The Hill during this week’s 3rd Friday events to see guest artist Kristin Moger and her show, “Melange, Seriously Fun Art.” Ms. Moger will be in the gallery to meet customers and talk about her work, which consists of ink originals and prints that depict nature and animals. Each piece takes anywhere from 30 to over 200 hours to create, so it’s quite an interesting process! After 2 months of unfavorable weather, June’s 3rd Friday forecast is sunny and warm! Be sure to head down to Main Street, Chestnut Street, and East Broad Street in Souderton this Friday for live music, family entertainment, food, desserts, and plenty of vendors. Start your night early with an escape at Play It Out, and then head into town to hang out with your hometown friends and neighbors.